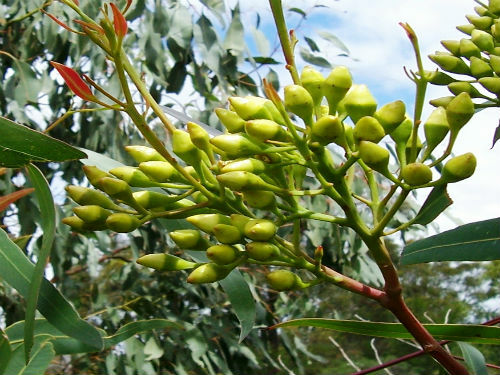 Eucalyptus curtisii, Plunkett Mallee, is a small tree that reaches a height of six metres. The bark is smooth, leaden grey to greenish-white and is shed in thin strips. Club-shaped buds are carried in large clusters. White, showy flowers appear in spring and early summer. Fruits are bell-shaped. In the wild Plunkett Mallee has multi-stemmed (mallee) growth habit. Cultivated plants usually confine themselves to a single trunk. Plunkett Mallee is a very ornamental small tree. Plants will often flower three years after planting. The blooms attract honeyeaters and various insects including native bees. E. curtisii has limited distribution is considered rare and threatened. Plunkett Mallee is found in southern Queensland. 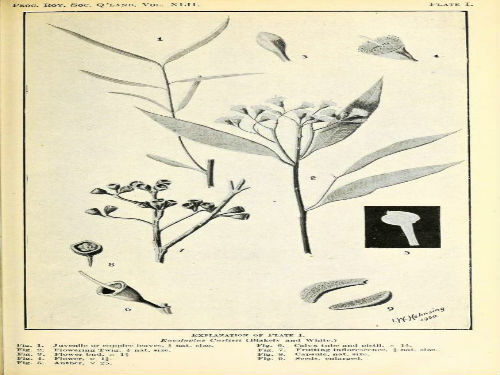 The species was named in 1931 from material collected in sandstone hills near Plunkett (hence the common name), 53 kilometres southwest of Brisbane, Queensland. The second image is the illustration that accompanied the original description. The species name honours Densil Curtis who was a farmer, naturalist and bushman who collected the type specimen.